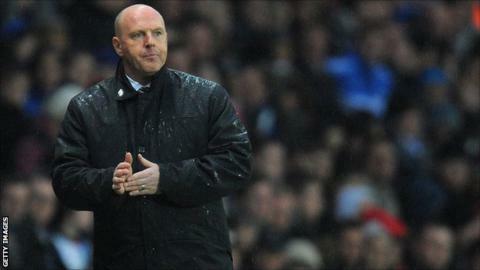 Steve Kean says he has been "forced to resign" as manager of Championship side Blackburn Rovers. The Scot, 44, has left with immediate effect, saying his position had become "untenable", and assistant boss Eric Black will now take charge of the team. Blackburn owners Venky's following a 2-1 home defeat by Middlesbrough. Kean said earlier on Friday that he believed the talks had been "positive and constructive". Rovers managing director Derek Shaw insisted he knew "nothing" about Kean's departure immediately after the release of his statement, before Blackburn later confirmed the Scot's resignation. Black, who joined Rovers in January 2012, will manage the side for the trip to Charlton on Saturday. Black has had managerial spells at Motherwell and Coventry, while also being assistant manager at Celtic and under Steve Bruce at Birmingham and Sunderland. Former Blackburn midfielder Tim Sherwood, now on the coaching staff at Tottenham, has been linked with the managerial vacancy at Ewood Park. Rovers were relegated from the Premier League in May but are third in the Championship table after taking 14 points from their first seven matches. Kean had been in charge of the Lancashire club since December 2010 when he replaced the sacked Sam Allardyce. The statement, which was issued through Kean's lawyers on Friday, said: "For reasons that I cannot discuss on legal advice, it is with deep regret, given my hard work and service for the club for a number of years, that I have been forced to resign as manager of Blackburn Rovers Football Club with immediate effect, due to my position as team manager becoming untenable. A large number of Blackburn supporters have held protests against Kean for much of his 21-month reign, but he had continued to retain the backing of Indian owners Venky's. There were more calls for his exit from a sizeable majority of the home crowd throughout Friday's loss against Middlesbrough, which was Rovers' first defeat of the Championship season. A fans' boycott has led to attendances at Ewood Park falling significantly, with the 13,405 crowd against Middlesbrough more than 9,000 down on the average crowds they were attracting in the Premier League last season. Former Scotland striker Kevin Gallacher, who helped Blackburn win the Premier League title in 1995, says it is vital for the club to unite following Kean's departure. "I know a lot of the fans will be out celebrating tonight," he told BBC Radio Lancashire. "But there are two halves to a football club, and they haven't joined together at Blackburn for the last 18 months. "They've got to get the boardroom right, they've got to get the management right and they have got to work together - and not just with each other, but for the people of Blackburn." Following Kean's appointment, Rovers only avoided relegation from the Premier League on the final day of the 2010-11 season with a 3-2 victory at Wolves. However, he was last season, ending the club's 11-year stay in the top flight.